When you work for a non-profit you get used to the shortest sentence in your job description becoming the biggest part of your job. Sometimes it’s not so fun- like picking up trash in an alley because someone complained about it and you know it’ll take forever to try and get anyone else to do it. Other times it leads to spray-chalking snowflakes up and down the 6 blocks of the Fulton Mall. It’s had me climbing down a building, moving furniture and ice skating at 5:00 AM. That little one liner that carries so much weight is “Other duties as assigned” and it’s a real doozy. It’s what keeps monotony away and most importantly it’s the thing that makes it entirely possible to accomplish everything a non-profit needs to accomplish with a small office staff. Needless to say, I wasn’t surprised when Kate asked me during a staff meeting to make a happy box. A stack of less than happy boxes. Let me back up. You’re probably thinking “Why on Earth would Kate ask for a Happy Box?” or even more likely, “What the heck is a Happy Box? !” or maybe you’re not thinking either of those things and you’re just wishing I’d get on with it. Things move pretty quickly around here. We have about 20 big projects at once (maybe more) that we’re all working on at the DFP office. We put a lot into what we do- not just time either. We get creative, we brainstorm, we mull things over and scrap ideas only when they’re too far-fetched, expensive or dangerous. We wake up in the middle of the night in a cold sweat with “Eureka!” moments when we suddenly have the missing piece to flesh out something we’ve been collaborating on for weeks. Our families are sick of our one track minds when it comes to downtown and we haven’t had a conversation with friends in months that hasn’t somehow slipped into downtown talk. And all of that is great! When revitalizing a downtown you absolutely want passionate people who can take a crazy idea and turn it into a reality. However, all of this very specifically focused energy means sometimes it’s hard to separate ourselves from cruel words and divisive actions and not take them personally. If you don’t know what I’m talking about, search “Downtown” or “Revitalization” on the Fresno Bee and scroll down to the comments section. We’re not really a sit-and-whine-about-it office though, so Kate devised the Happy Box. She envisioned a place where we could put all of our wins- the things that feel good and mark our progress. When the naysayers bring their little rain-cloud of negativity we can stop it at the door and cloak ourselves in the joy that our work brings to us and remind ourselves of why we love what we do. I’m pretty sure that a Happy Box could be beneficial to everyone, though. We all have bad days, right? And really, nothing beats a craft project when it comes to the blues and blahs. So get out your mod podge and c’mon get happy. First you’re gonna need a box. 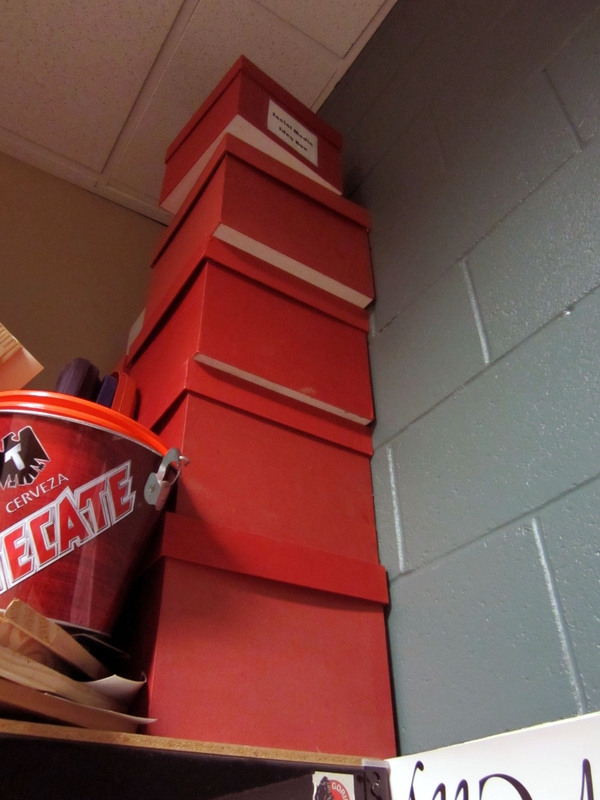 Luck would have it that we have this HUGE stack of red boxes with holes already cut in the top. I didn’t ask before I grabbed one if they went to anything. So, sorry about your box, SUDZ or Chile Festival or whatever you were for. Happiness knows no bounds! Newspaper the heck outta your workspace. I did mine at my desk which meant I needed to use more care than I would at home. Which is to say that I pretty much call down an epic rainstorm of glitter every time I do anything at home and drive my neat freak significant other batty. But this is work and they don’t pay me to be a glittering Pig Pen. Pick your backdrop. I love using black and white photos for backgrounds because they make color pop without looking too busy. You want to completely cover the surface of the box in big, bold statements. 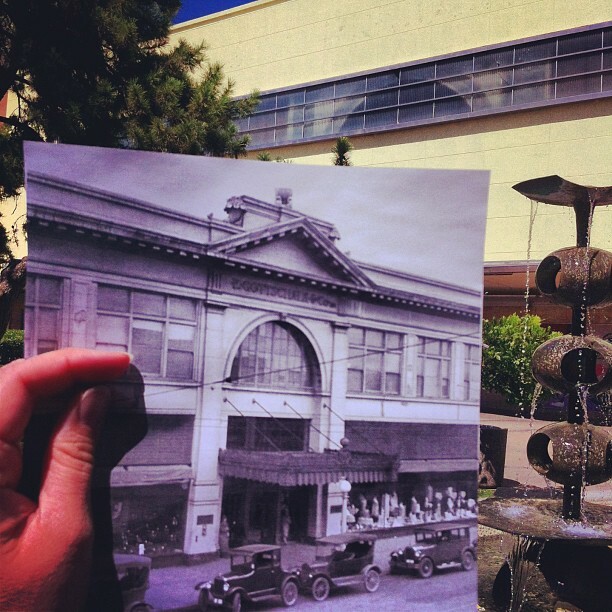 For ours, I pored through all kinds of historical photos of downtown. While I was looking I found this image of Gottchalks that totally blew my mind because you can actually still see the arch hidden behind the facade and corrugated glass. Seriously, I stood outside the office just staring at the strangely eerie form, peeking out from behind the window and hidden in plain sight. Next, pour your Mod Podge into a bowl. I like the kind that makes everything glossy. You’ll need a paint brush too, and not some chintzy little paint by numbers brush. Think more along the lines of “I’m painting the trim on my house.” Okay, maybe not that big, but you get my point. Brush it on, set your images on top and let it dry. I recomment letting your images overlap to the interor of the box and tacking them down for a more durable hold. Then brush a coat on top, insuring all edges are pushed down- including the inside of the box and box lid where you’ve overlapped. Let that dry. While it’s drying, cut your colorful statement out. I love little flags because they invoke that excitement that something big is happening. Plus, they’re adorable. Brush on another coat of Mod Podge and gingerly set each piece exactly where you want it. Mod Podge can dry pretty quickly so you want to make sure you have things positioned just right. Then brush on another coat when that last one is dry. Let that dry and if you want to get shimmery, now is the time. I don’t like to inundate a piece with glitter, but instead sprinkle it on sparingly for maximum effect. I do it by pinch-ful and distribute evenly. Let this dry completely, too. You’re almost done. Brush on two additional coats and let it dry overnight before putting the lid on. Taa-daa! A Happy Box for happy thoughts! Put out a mason jar with brightly colored paper and Popsicle sticks for people to put their happy thoughts on. Why the Popsicle sticks? So that when you shake it it even sounds happy! So what’s in our Happy Box so far? Our upcoming collaboration with Fresno State’s PR students. The guys on their bikes that meet at the clock tower. Peeve, the inspiration behind Peeve’s Public House . The time we accidentally printed our dining guide too small and made a little 3″ mini dining guide that caused us all to giggle. Kim Schoelen- I LoVe your Happy box article- (DIY Tutorial)! you did a very good job writing the article- explaining they “why” of your Happy Box along with the “how”…but I got the msg that the Why was definitely the reason for the article and not the How! I LoVe your attitude too…no back stabbing those naysayers..you just went happily about your business and made your Happy Box- and even figured out a way for it to “sound” Happy! Go get ’em Happy Girl!